Hohner 1501-BX. A beginner's harmonica in the key of C.
The Hohner Blues Band harmonica is a quality beginner's instrument that remains inexpensive. Tuned in the key of C, the Blues Band harmonica sounds great for any style of music. 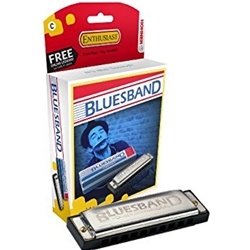 Hohner recommends the Blues Band harmonica for children and for beginners of any age. They even include a song sheet of simple and familiar melodies in easy to learn harmonica tab to get you started. Get started today with a great beginners harmonica.